“Indeed,” Taraka said, nodding his head in agreement at the elderly monk displayed on the holoscreen of the Maverick’s comms terminal. “And what of Brother Shareef’s Pokemon?” the older monk asked. “I see,” the older monk on the other end of the call said. “I believe that it was taken by the killer,” Taraka continued. “If it is alright, I would like to continue looking into this as well,” Taraka said. Taraka bowed in respect. “Thank you.” The screen then went black as the call ended. Taraka took in a deep breath, then turned away from the comms terminal. Once the Federation investigators had arrived on the scene and begun their investigation, Taraka had contacted the Congregate to inform them of Shareef Patil’s death, as well as his own plan to investigate the mysterious shadowy figure. The Congregate seemed content to wait for the Federation authorities to carry out their investigation, but something about that figure deeply bothered Taraka. He knew he wouldn’t feel right if he didn’t look into this matter for himself. As soon as possible, Taraka wished to begin searching for clues as to the identity of the mysterious figure, but first there was business to attend to. The monk looked down at the Pokeballs in his hands; they contained Shareef Patil’s Pokemon, a Lucario and a Medicham. 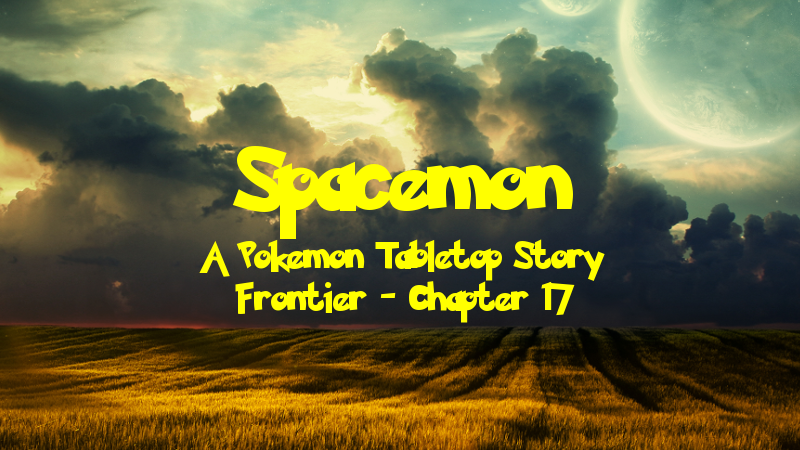 He wanted to take them to Meridian, a planet he knew was home to many fighting type Pokemon, so that he could release them into the wild. Taraka knew they would be happy there. Taraka placed the Pokeballs into his pocket, then departed from the room. He needed to find the captain and inform him of his plan. “Go and be free,” Taraka said as he looked into the eyes of the two Pokemon that formerly belonged to Shareef Patil. Through his own psionic abilities, as well as the unique capabilities of Lucario and Medicham, the monk could sense the two Pokemon could understand his desire for them to go free and find peace on this world. After this brief shared moment, the Pokemon turned away from the lake shore and headed for the treeline of the jungle. A somber smile appeared on Taraka’s face as he watched the Lucario and Medicham disappear into the foliage. Even though their trainer had passed on, the monk knew they would be able to thrive on this world amongst the Machamps, Pangoros, and other fighting type Pokemon he knew to dwell in the jungles of Meridian. Once they had gone, Taraka began the trek back to the Fortuna spaceport. The jungle lake where the monk had released the Pokemon back into the wild was a ways away from the settlement, at the end of a winding path leading down the cliffs into the dense jungle and along the banks of the river. It had seemed a good place to release them, and Taraka certainly didn’t mind the peaceful walk through nature. A good hour or so later, Taraka walked into the spaceport. After the long hike down to the lake and back, he was eager to return to the Maverick and rest. As he crossed the spaceport’s atrium, headed in the direction of the landing platforms, Taraka’s attention was captured by a well-dressed man manning a curio table nearby other merchants selling their wares. This tall, bearded, dark-haired man seemed particularly out of place amongst the usual Outer Rim merchants and traders one expected to find in a colony spaceport. As Taraka passed, the man seemed to catch his gaze. “Right this way, good sir!” he exclaimed, a posh Genevan accent quite apparent. “See for yourself what I have to offer!” he continued, waving the monk over. More curious than anything, Taraka approached the man and his curio table. The man, who did not appear to be that much older than Taraka himself, looked expectantly at him as the monk stepped up to the table. Examining the goods on display, Taraka noted what seemed to be brightly colored gemstones and what he could only assume were Pokemon accessories. Again, Taraka noted how out of place this man and his wares seemed to be in this spaceport. Intrigued, Taraka looked up from the table. “Is there any reason someone such as yourself is out here selling his wares all by himself?” he asked. Taraka smiled. “I am happy to assist,” he said. “Our ship is docked just over there,” the monk continued, motioning towards the landing platforms. “Of course,” Taraka said, nodding. Captain Cyrus Drake lay on his bed in his quarters aboard the UAS Maverick as he awaited Taraka’s return. He was eager to depart for Khalimuck to unload the salvage his crew had gathered on their last stop and get paid, but he was making use of the downtime on Meridian to get in some relaxation. As much as he was used to squeezing his rest in where he could between jobs, the Maverick’s captain appreciated the peace and quiet of a ship docked at port, its normally droning engines silent. This was a rare occurrence aboard his ship, so he was certainly going to make the most of it. “A pleasure to meet you, sir,” Roland said, offering his hand. Cyrus nodded and shook the man’s hand. He seemed to be quite friendly. “Where ya headed?” Cyrus asked. “If it is not too much trouble,” Roland said. As the UAS Maverick flew through warp space en route to its next destination, Roland walked through the corridors of his new means of transport accompanied by the ship’s captain. Cyrus led the way as they stepped out of the cargo bay, which had been the first stop on the tour pointing out the rooms as they passed them by. “I’m sure I will,” Roland commented. “This room belongs to Erik, our engineer,” Cyrus continued, pointing out the next one over. “He’s usually in his workshop,” he said, leading Roland into the room across from the med bay. Entering the room, Roland saw a man with a thick mustache, who he could only assume was Erik, giving a humanoid-looking robot a tune-up. Both the man and the robot looked up at him and the captain as they entered. “Who’s this guy?” the robot asked. Its voice was surprisingly realistic, which caught Roland by surprise. “How do you do, sir?” Roland asked, nodding at Erik. “Then I think we’re going to get along just fine, Roland,” Erik said, offering his hand. “I’m sure we are, sir,” Roland agreed, giving the engineer’s hand a firm shake. Over the next few minutes, the Maverick’s captain led Roland through the rest of the ship, pointing out his own quarters and those of the ship’s pilot, showing him around the living quarters, and finally bringing him to the front of the ship to meet the pilot herself. “This is our pilot, Anya,” Cyrus said, introducing Roland to the young Romanov woman who was responsible for flying the Maverick. “I must say, I did not expect to find someone so young piloting a ship such as this,” Roland commented. “So, if I may ask, where are we headed to next?” Roland asked after a few moments. “Oh, you know, ancient tech and that sort of this,” Cyrus explained. “We even found a piece that still seems functional, not that we know what it does,” he added, letting out a laugh. “So then you might know more about this?” Roland asked, looking over at Ace. “I don’t remember anything from before these guys reactivated me,” the android explained. Roland handed the object to Ace, who looked at it for a few moments before shaking his head. “I don’t think that’s how it works,” the android said, passing the object back to Roland. “Watch where you go inserting things,” Ace warned, eyeing Roland cautiously. “We might want to get off the ship before we try that,” Taraka pointed out. Notes: And so the revolving door of players has begun. This session was the first after IR dropped out of the campaign and the first to feature our new player in the role of Roland. I was glad to have a relatively seamless transition. Axel was unable to make it to this session so it was just Novi and the new guy. I quickly wrapped things up on the planet from the previous session and got the ship back to a civilized planet to bring in the new player so he wasn’t sitting around for too long. Unfortunately, I forgot to start recording again, so everything that happened before Taraka and Roland met was lost. Over a year later when I sat down to write this, I had completely forgotten what had happened, so I had to make it up. I’m happy with how it turned out. There is still more to the session, but it made sense to break the chapters up here, leaving this one to focus on Roland’s introduction to the Maverick crew.